Figure 1 Structure of (a) activated floc and (b) biofilm on solid surface. Investigation of activated sludge flocs and biofilms concerns the following issues: (1) morphology, that is, size and shape; (2) composition, that is, internal structure; (3) identification of microbial species; and (4) spatial arrangement of microorganisms. Traditionally, the detection of bacteria in wastewater is restricted to the ability to culture them. However, it has become evident that most organisms are unculturable which is the reason for our limited knowledge of the microbial actors in WWT processes. Recent advances in molecular techniques have supplied the means for examination community structure and detecting specific organisms in complex ecosystems without cultivation. Most techniques are based on nucleic acid fingerprinting after amplification by the polymerase chain reaction (PCR) of extracted DNA or RNA. Examples of techniques used are amplification of riboso-mal DNA restriction analysis (ARDRA), denaturing gradient gel electrophoresis (DGGE), and terminal-restriction fragment length polymorphism (T-RFLP). Microarray technology seems to be promising in capturing the taxonomical or functional structure of complex ecosystems. In this technique a vast number of oligonucleotide probes of known genes can be attached (spotted) to the surface of a glass slide. Extracted DNA or RNA from an unknown sample is then applied to the microarray plate. After hybridization the presence of target organisms will appear as radiant or fluorescent spots. Moreover, the intensity reflects the concentration of the sequence. By constructing a DNA microarray containing probes targeting the 16S rRNA of several groups of nitrifying bacteria the presence of Nitrosomonas spp. has been detected without need for PCR amplification prior to analysis. However, the technique failed to detect Nitrospira and Nitrobacter, but its future potential was clearly demonstrated. Fluorescence in situ hybridization (FISH) is an effective technique to detect specific bacteria in complex microbial communities. By use of confocal laser scanning microscopy (CLSM) FISH images ofnitrifying bacteria in biofilms ofdomestic waste-water have been analyzed. Where the C/N ratio of the substrate was high, heterotrophic bacteria occupied the outer part ofthe biofilm while ammonium oxidizing bacteria were distributed in the inner part. As the C/N ratio gradually decreased, the nitrifying bacteria began to colonize the outer layer. The use of the molecular approaches discussed above has drastically widened our knowledge on bacterial diversity in WWT systems. Until 2002 more than 750 16S rRNA gene sequences derived from wastewater had been analyzed and sequences affiliated to the Beta-, Alpha-, and Gammaproteobacteria as well as the Bacteroidetes and the Actinobacteria were most frequently retrieved. Many new, previously unrecognized, bacteria have been detected, and many more, without doubt, await identification. Although some ofthe newly identified organisms can be attributed to the flocculation process as well as the biological nitrogen and phosphorus removal processes, most of them possess unknown functions. Not until it is fully understood can the potential ofthe biological component ofthe WWT system be fully utilized. Figure 2 Carbon and electron flow in aerobic respiration. Box represents the microbial cell. compound descends a redox ladder commonly consisting of the glycolysis, citric acid cycle (CAC), and finally the electron transport chain. The ultimate aim is to convert energy into proton gradients and ATP. 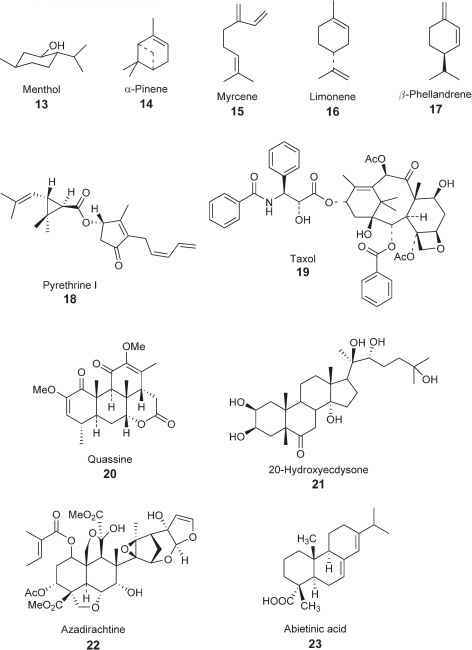 During the metabolic pathway various intermediate organic molecules are withdrawn to enter the anabolic route, that is, building blocks incorporated into new cell material. Roughly, in actively growing heterotrophic cells, 50% of the substrate carbon will form new cells while the other 50% will be released as mineralized carbon dioxide (CO2). In a less strict sense respiration can be defined as the uptake of oxygen while at the same time carbon dioxide is released. However, in the ecosystem, CO2 is also formed by other processes such as fermentation and abiotic processes, for example, CO2 release from carbonate. In addition, several types of anaerobic respiration can take place where, for example, nitrate or sulfate are used by microorganisms as electron acceptors; hence, O2 is then not consumed as in aerobic respiration. Removal of phosphorus from the wastewater stream is a common strategy to control eutrophication. The idea is to limit this element in the ecosystem and hence starve the organisms to avoid growth and increase in biomass. In all cases, phosphorus is removed by converting the phosphorus ion into a solid fraction. Chemical orthophosphate (PO4~) removal uses the property of metal ions like Al3+, Ca2+, Fe2+, Fe3+, or Mg2+ to effectively react with phosphorus and form stables precipitates, under specific sets of pH. These ions may be naturally present in some soils and, hence, the phosphate will be adsorbed to surfaces. Alternatively, chemicals containing these ions can be added to the WWT system and the precipitate formed mechanically removed after having settled. Not only phosphorus is affected by the chemical addition, the pH may also change and the content of organic matter in the water may be reduced. Both these events will affect the micro-bial activity in the system. An alternative to chemical precipitation is to employ plants, macrophytes, microalgae, or bacteria, or combinations of these, to concentrate the phosphorus. All cells need phosphorus and the uptake ofthis element is part of the natural metabolism. Phosphorus is an essential component of nucleic acids and phospholipids are located in the various cell membrane systems. In addition, the pH of the cell is regulated by a phosphate buffer system. Therefore, phosphorus is needed in high quantities and the cell normally constitutes 1-3% phosphorus per gram dry matter. To achieve real removal of phosphorus the produced biomass must be harvested. In the activated sludge process under certain conditions, it may be possible to enhance the storage capacity of highly energy rich polyphosphate by the bacterial biomass. Figure 3 Release and uptake of phosphorus by polyphosphate-accumulating bacteria under varying oxygen status. Shaded boxes represent bacterial cells, Poly-P is polyphosphate, and PHA is poly ,3-hydroxyalkanoate. Under anaerobic conditions in the WWT reactor principally acetate, but also other volatile fatty acids (i.e., fermentation products) are taken up and incorporated in biopolymers like poly /3-hydroxyalkanoate (PHA) or glycogen (Figure 3). In the anaerobic stage the level of polyphosphate in the cell decreases while at the same time soluble phosphate is released. When conditions are changed to aerobic and carbon-poor, the stored reserve of PHA is used as an energy and carbon source for uptake of even larger amounts of phosphorus than previously released to the system. The concentration of phosphorus in polyphosphate-accumulating (PAO) bacteria can then be increased up to >15%. In the end of a successful process the buoyant density of the sludge should have increased. The polyphosphate forms dense granules that can be stained and easily observed under the microscope. The ecological mechanisms selecting for polyphosphate-accumulating organisms are not clearly understood. Originally strains of Acinetobacter were thought to be the key players in the process. The role of Acinetobacter has been argued against as recent molecular biology-based tools for identification of bacteria have demonstrated that other bacteria, for example, Rhodocyclus spp., Dechloromonas spp., and Tetrasphaera spp., may dominate the polyphosphate-accumulating community. In microbial ecosystems nitrogen is of special interest, as it can exist in several oxidation levels ranging from ammonium/ammonia (—III) to nitrate (+V). Moreover, the transitions of nitrogen, both oxidation and reduction, are mediated mostly by microorganisms and, in particular, bacteria. When transformed, the nitrogen compounds may serve as building blocks in the cell, as energy sources, or as a way of dumping electrons. Virtually all microorganisms can mineralize and immobilize nitrogen, and the processes are more or less independent of oxygen. Proteins and nucleic acids, being the two dominating macromolecules in the cell, contain nitrogen as an essential component. Thus, most organic matter contains at least some nitrogen. By predation or after cell death and lysis the nitrogen-containing molecules will be released (Figure 4a). However, due to their molecular size, they cannot be directly taken up and immobilized by new bacteria. Growing bacteria exudes so-called exoenzymes that attack and degrade the macro-molecules into smaller portions: amino acids and ammonia that can be transported through the cell membrane. The fate of the nitrogen part will depend on the nitrogen and carbon status of both the cells and the environment. In a carbon-rich environment with high ratios of carbon to nitrogen (>20) all nitrogen will be assimilated, that is, immobilized in the cell. If the ratio is low (<10), nitrogen will be mineralized and released to the environment. The release of ammonium might also lead to an increase in pH due to the alkaline properties of ammonia (NH3). Figure 4 Five microbial nitrogen transformation processes leading to nitrogen removal in the ecosystem. 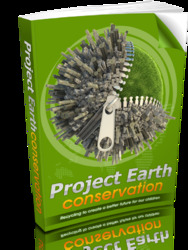 For each process its relation to the environmental oxygen status is given. Shaded boxes represent microbial cells. can be the formation of nitric or nitrous oxide that will be emitted to the atmosphere. In addition, AOBs produce protons which will lower the pH somewhat. Denitrification is the anaerobic respiration process in which nitrogenous oxides, principally nitrate and nitrite, are used as terminal electron acceptors and, hence, reduced into the gaseous products nitric oxide (NO), nitrous oxide (N2O), and dinitrogen (N2) (Figure 4d). The process is controlled by factors such as pH, supply of organic carbon and mineral nitrogen, and aeration. Normally, dinitrogen dominates the end product but under conditions not optimal for the organisms nitrous oxide can constitute a considerable fraction. Nitrous oxide contributes to the global warming as well as to the depletion of the ozone layer in the stratosphere. Denitrifying capacity is represented within most taxonomical and physiological groups of bacteria. Denitrifiers are facultative anaerobes, that is, they prefer oxygen as terminal electron acceptors in their respiration but upon depletion of oxygen they rapidly switch into the use of a nitrogenous oxide. Denitrifiers, of which most are organotrophs and heterotrophs, are known to use only the easily available fraction of the organic matter. It should also be mentioned that some bacteria like Paracoccus denitrificans have been found to denitrify under aerobic conditions. In addition, the AOB Nitrosomonas europea may, under certain conditions, denitrify aerobically, resulting in dinitrogen gas and nitrite as end products. Conventional nitrogen removal techniques are based on a combination of autotrophic nitrification and denitrification. The nitrogen pathways in bacteria are more complex than earlier thought. 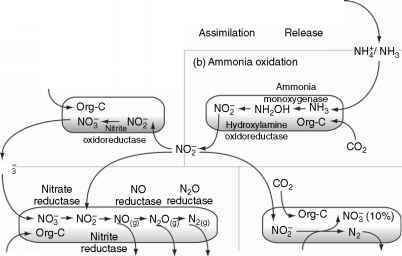 It was recently discovered not only that some ammonium oxidation bacteria can denitrify, but also that lithoautotrophic bacteria belonging to the phylum Planctomycetes can perform anaerobic ammonium oxidation (anammox); they oxidize ammonium with nitrite as the electron acceptor to yield dinitrogen gas (Figure 4e). Lipids of anammox bacteria contain a combination of ester-linked (typical of the Bacteria and Eukarya) and ether-linked (typical of the Archea) fatty acids. Like the autotrophic nitrifiers, internal lipid membranes of anammox bacteria are essential to create proton gradients. While the membranous compartmentalization in nitrifiers is arranged as stacked lamellae, in the anammox bacteria the compartmentalization involves a large single vesicle, called anammoxozome. Although they rely on the same biological principles, treatment plants and wetlands for WWT operate very differently regarding flow of water through the system. Treatment plants can generally be considered to act as a well-mixed reactor in which the contact between solutes and the microbial flocs is sufficiently effective not to limit the reactions. The mixing is assured by mechanical stirring in the water circulating through relatively narrow and long stretched basins. Because wetland systems rely on natural mixing of the water, it is essential to have an appropriate planning of the wetland shape, bottom bathymetry, and placement of vegetation - factors that control the water circulation on its way through the wetland. A canalized flow through the center of a wetland pond with vegetation on the side along the flow channel implies a separation of the main flowing water from the host environment for biofilms, that is, the vegetation stems. Introducing deep zones in the bottom or vegetation zones transverse to the flow direction can counteract this. Both measures even out differences in pressure head of the water flow, which should provide a more uniform flow and better utilization of the entire wetland volume. Generally, it is also better to place the in- and outlet in such a way that the water flow is as stretched out as far as possible. This can be arranged also by introducing hanging separation walls or dams. The reactions of phosphorus and nitrogen in treatment systems involve kinetic processes related both to the timescale (on the order of seconds) for circulation of solutes and water as well as the kinetics of the biological processes and sorption. This section gives a general theoretical basis by which we can describe the interactions of processes in a manner that principally links the scientific basis of the individual mechanisms with the gross system response. Jo where C(t, r) is the concentration of nitrogen dissolved in water at time t (i.e., [N]) and at the exit point of the wetland defined by the residence time r.
Recognizing eqn  as an approximation of the integrated system concentration response, we have divided the problem in a multidimensional water flow problem to define water residence time PDF f(r) and a one-dimensional problem of the nitrogen concentration response along each flow path C(t, r). For a well-mixed reactor of a wastewater treatment plant (WWTP, see below), the all-water parcels stay equal time expressed by the 'nominal' water residence (detention) time, that is, the ratio between flow volume V and discharge Q. Mathematically, this means that f (r) = 6(r — V/Q), where 6 is the Dirac delta function. Hence, eqn  yields (C(t)) = C(t, r — V/ Q), suggesting that the average response is given by a single value ofthe response concentration curve associated with a residence time r = V/Q. Specifically, for a steady-state reactor with constant input and external constraints, we have (C) = C(r — V/Q). Because of the complicated mixing conditions of treatment wetlands, the nominal residence time is often a poor approximation. Open water flow in two dimensions basically follows the so-called Saint-Venant equations, that is, the depth-averaged form of the momentum equation. However, generally scientists and engineers neglect inertia effects in the analysis of wetland flows, which yields a significantly simpler mathematical statement for the flow problem. A main problem is to relate the friction losses to, for example, the distribution of vegetation, in particular, since this controls the flow pattern and solute mixing in wetlands. In addition to a passive advection with the flow, solutes undergo mixing such as dispersion and exchange with stagnant zones in vegetation and bottom sediments. This leads to a calculation procedure, demonstrated in Figure 5, that results in a physically-mathematically based estimation of the flow residence times. where (r) is the expected value of the residence time. The lack of physical basis of the model implies that the number of compartments M needs to be determined explicitly from comparison of the model prediction and results of tracer injections in the wetland such as those shown in Figure 5d. Generally, it has been found that the M value falls around 3. A main advantage ofthe functional form is that it can easily be utilized in eqn . Figure 5 Figures exemplifying the procedure with which a physically based flow model can be used to derive the water residence time distribution in a treatment wetland pond. (a, b) Measured bathymetry in the pond as well as an estimated vegetation distribution. This information is used as input for the flow modeling that consists of two steps, one in which the water surface elevation and flow velocities are calculated (not illustrated here), and one in which numerical particles are released at the pond inlet to determine the streamlines and flow residence times (c). The simulated flow residence times can be compared with flow residence times determined from tracer experiments (d). Partly reprinted after Kjellin J, Worman A, Johansson H, and Lindahl A (2007) Controlling factors for water residence time and flow patterns in Ekeby treatment wetland, Sweden. Advances in Water Research 30(4): 838-850.
in which q is the specific bacterial activity, X is the number of bacteria, and K is a saturation coefficient or a critical concentration representing conditions when the bacteria are in a transition between limiting and nonlimiting state. The original Michaelis-Menten equation assumes that qX is constant, whereas here we assume that the number of bacteria can vary with time. For a constant number of bacteria, K can be seen as a constant saturation concentration. Equation  approaches the zero-order form dC/dt = —qXfor non-limiting conditions (i.e., C >> K) under which the nitrogen concentration is not important for the reaction. Only the amount of enzymes (number of bacteria) controls the reaction. Under limiting conditions (i.e., C << K), which is the main interest for treatment wetlands, eqn  approaches the first-order form dC/dt = —(qXC )/K that reflects a control on the reaction of the nitrogen concentration. The ratio (qX)/K is the denitrification rate coefficient. where C0 is the initial concentration. The activated sludge process in a WTP is run under carbon excess. By controlling the removal of the activated sludge, the concentration of bacteria is kept on a fairly constant level. Further, the circulation of wastewater ensures approximately a constant residence time that balances the nitrogen-reducing processes between nitrogen-limiting and -nonlimiting conditions. In treatment wetlands with carbon excess due to sufficient carbon production in plants, we can normally assume nitrogen-limited conditions. where k is the first-order volumetric coefficient for total nitrogen reduction. From this formula we can see that the most effective treatment is obtained when M approaches infinity for so-called plug flow. in which S is substrate concentration (carbon concentration), Ks is the substrate saturation coefficient, and ^max is the maximum population specific growth rate constant. The linear, first-order differential equation for bacterial number means that the bacteria grows exponentially with time as long as the growth process is unlimited. A change of the nitrogen load to a biological treatment system, thus, leads to a change in the bacterial community and in the denitrifica-tion rate coefficient. Sometimes one can see variants of the Monod growth rate formulation involving the nitrogen concentration in another factor similar to the factor in which substrate concentration is included in eqn . where [N2O-N] denotes the nitrogen concentration in the form of N2O. Since the rate of mass production of N2O-N is assumed to be the same as the rate of mass reduction of total N available in dissolved phases in water provided in the assay, the qX factor in eqn  is the same as that in eqn . Figure 6 Example of laboratory measurement of kinetics in N2O production with initially unlimited conditions in nitrate and carbon involving a first-order growth of the bacterial population and enzyme kinetics. The initial phase - before dashed line marked with '1' - is controlled by increased bacterial activity or growth. Thereafter, the number of bacteria is constant due to the linear increase of N2O production. As nitrogen becomes limiting, the reaction is succeeded by nitrogen deficiency and a first-order production rate. This result was obtained from a sediment sample taken in Ekeby wetland, Eskilstuna, Sweden. systems, the bacteriological composition reaches such an equilibrium in the bacteria populations after a short while due to limitation of carbon and/or nitrogen and follows the second phase of the experimental results shown in the figure. The PDA associated with the treatment system is defined from the initial slope of the N2O production versus time relationship, since the initial amount of bacteria X0 in the sample is believed to represent the state ofthe treatment system in which the sample was taken. At the transition to nitrogen-limited conditions, the product qX is the time rate of reaction of nitrogen in units mass per unit time and volume, so the ratio qX/K is the denitrification rate coefficient, where K is a limiting nitrogen concentration at the transition. A batch reactor undergoes all stages represented in Figure 6, whereas the continuous flow system is generally kept at steady state (see section entitled 'Continuous flow systems and SBRs'). In treatment wetlands with sufficient carbon supply from moldering vegetation, denitrification is nitrogen limited and first-order controlled by the nitrogen concentration. The denitrification rate coefficient is given by qX0/K.